"Coca-Cola". Size: 2B52. Padlock Stamp #: 0066-E. Color: Green. Made for: Coca Cola Bottling Company of Los Angeles, California. Mfg by: Best. "COLGATE-PALMOLIVE CO. CP QUALITY PRODUCTS SINCE 1806". Size: 5B71. Padlock Stamp #: 0912-E. Color: Black. Made for: Colgate- Palmolive Co., Jersey City, New Jersey. Mfg by: Best. Colt. Size: 4B60. Padlock Stamp #: 1346-E. Color: Green. Made for: Colt Industries, Beloit, Wisconsin. Mfg by: Best. "COMMONWEALTH CT TELEPHONE CO". Size: 21B72. 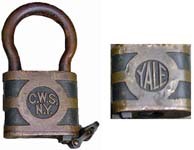 Padlock Stamp #: 1869-R. Color: Blue. Made for: Commonwealth Telephone Co., Dallas, PA. Mfg by: Best. "COMMONWEALTH CT TELEPHONE CO". 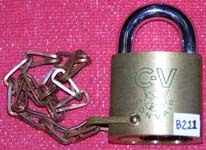 Size: 21B72-M. Padlock Stamp #: 1869-R. Color: Blue. Made for: Commonwealth Telephone Co., Dallas, PA. Mfg by: Best. "Community Hospitals Indianapolis". Size: 21B72. Padlock Stamp #: 1982-R. Color: Black. Made for: Community Hospitals Indianapolis, Indianapolis, Indiana. Mfg by: Best. "COMSAT". Size: 21B72. 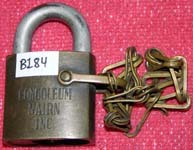 Padlock Stamp #: 1736-R. Color: Green. Made for: Communications Satellite Corporation, Washington, D.C. Mfg by: Best. "CONGOLEUM NAIRN INC.". Size: 2B52-M1. Padlock Stamp #: 0079-E. Color: Not determined. Made for: Congoleum Nairn Inc., Kearny, New Jersey. Mfg by: Best. "CONNECTICUT TEL & ELECTRIC CO. MERIDEN, CT. AUTO LOCK". 2 1/4" high. Brass case. Steel shackle. 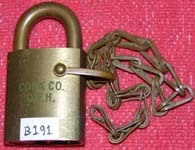 Mfg by: Possibly Corbin Cabinet Lock Co.
"CONOCO". Size: 1B60. Padlock Stamp #: 0982-E. Color: Red. Made for: Continental Oil Company, Inc., Westlake, Louisiana. Mfg by: Best. "CONOCO". Size: 21B72. 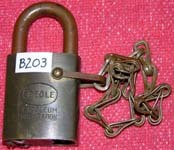 Padlock Stamp #: 1980-R. Color: Red. Made for: Continental Oil Company, Inc., Westlake, Louisiana. Mfg by: Best. "PROPERTY OF CONSOLIDATED VULTEE AIRCRAFT CORPORATION". Size: 4B62-M1. Padlock Stamp #: 0471-E. Color: Green. Made for: Consolidated Vultee Aircraft Corp., San Diego, California. Mfg by: Best. "33 CONST 2 - B 529 - 4". Size: 2B59. Padlock Stamp #: 0146-F. Color: Not determined. Made for: Commonwealth Edison Company, Chicago, Illinois. Mfg by: Best. "CONVAIR". Size: 4B62. Padlock Stamp #: 0799-E. Color: Not determined. Made for: Consolidated Vultee Aircraft Corp., San Diego, California. Mfg by: Best. "CONVAIR ASTRONAUTICS". Size: 4B62-M1. Padlock Stamp #: 0780-E. Color: Green. Made for: General Dynamics, San Diego, California. Mfg by: Best. "COOK CO. O. F. H.". Size: 2B70-M1. Padlock Stamp #: 0967-E. Color: Green. Made for: Oak Forest Hospital, Oak Forest, Illinois. Mfg by: Best. "COOPER" - Paperweight. Size: 4B62. 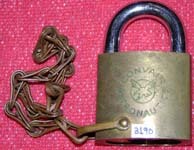 Padlock Stamp #: 1613-E. Color: 626. Made for: Humboldt Marine Services, Fields Landing, California. Mfg by: Best. "Copps". Size: 11B72. Padlock Stamp #: 1518-R. Color: Orange. Made for: Copps Distributing Company, Stevens Point, Wisconsin. Mfg by: Best. "CORBIN....". 2.13" high x 1.36" wide. The shackle tappers to a scant .132". Brass case. Steel shackle. Unusual special purpose shackle. 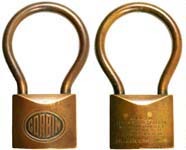 Mfg by: Corbin Cabinet Lock Co.
"CORBIN". 1 15/16" wide. Brass case. Mfg by: Corbin Cabinet Lock Co. US Patent #D54874. "CORCO". Size: 2B63. Padlock Stamp #: 1296-F. Color: Red. Made for: Commonwealth Oil Refining Company, Penuellas, Puerto Rico. Mfg by: Best. Corpoven. Size: 21B72. Padlock Stamp #: 0831-R. Color: Red. Made for: Corpoven, SA - Venezuela. Mfg by: Best. "CORRIGAN CO.". Size: 4B62-M1. Padlock Stamp #: 0420-E. Color: Not determined. Made for: Corrigan Company Mechanical Contractors, St. Louis, Missouri. Mfg by: Best. "P. U. D. COWLITZ COUNTY". Size: 4B62. Padlock Stamp #: 0941-E. Color: Green. Made for: Public Utilities District, Cowlitz County, Longview, Washington. Mfg by: Best. "CPN PIPELINE CO.". Size: 11B72. 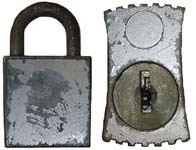 Padlock Stamp #: 2144-R. Color: Black. Made for: Calpine Corporation, Folsom, California. Mfg by: Best. "PROPERTY OF C. P. P. CO.". Size: 5B72. Padlock Stamp #: 0060-E. Color: Green. Made for: Colgate-Palmolive-Peet Company, Jeffersonville, Indiana. Mfg by: Best. "CPU". Size: 2B79. Padlock Stamp #: 0914-F. Color: Green. Made for: California Pacific Utilities, San Francisco, California. Mfg by: Best. "PROPERTY OF C.Q.B.". Size: 4B70. Padlock Stamp #: 0043-E. Color: Not determined. Made for: Copper Queen Branch, Phelps Dodge Corporation, Douglas, AZ. Mfg by: Best. "CRANE CO.". Size: 5B72. Padlock Stamp #: 0077-E. Color: Green. Made for: Crane Company, Chicago, Illinois. Mfg by: Best. "CREOLE PETROLEUM CORPORATION". Size: 2B700-CM1. Padlock Stamp #: 0532-E. Color: Green. Made for: Creole Petroleum Corp., New York City, New York. Mfg by: Best. "CSC". Size: 2B59. Padlock Stamp #: 0044-F. Color: Black. Made for: Consolidated Steel Corporation, Los Angeles, California. Mfg by: Best. "CSC N. O.". Size: 2B59. Padlock Stamp #: 0345-F. Color: Not determined. Made for: Consolidated Steel Corporation, Naval Ordnance, Los Angeles, California. Mfg by: Best. "CSU Cleveland State University". 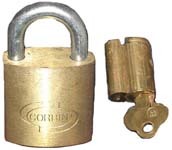 Size: 21B72-M. Padlock Stamp #: 1989-R. Color: Green. Made for: Cleveland State University (Cleveland, Ohio. Mfg by: Best. "CT". Size: 4B72. 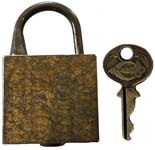 Padlock Stamp #: 1690-E. Color: Black. Made for: Continental Telephone Company. Mfg by: Best. "CT". Size: 11B72. Padlock Stamp #: 1929-R. Color: Green. Made for: Calgary Transit, Calgary, Alberta, Canada. Mfg by: Best. "C.U.C. TEL.". Size: 2B62. Padlock Stamp #: 1497-E. Color: Green. Made for: Citizens Utilities Company Telephone, Stamford, Connecticut. Mfg by: Best. "CUMMINS". Size: 6B72. Padlock Stamp #: 0658-E. Color: Green. Made for: Cummins Engine Company, Columbus, Indiana. Mfg by: Best. "C-V CONVAIR". Size: 4B62-M1. Padlock Stamp #: 0799-E. Color: Green. Made for: Consolidated Vultee Aircraft Company, San Diego, CA. Mfg by: Best. "CW L&P". Size: 2B63. Padlock Stamp #: 0229-F. Color: Green. Made for: City Water Light & Power, Springfield, Illinois. Mfg by: Best. "CWS". Size: 2B69. Padlock Stamp #: 0560-F. Color: Not determined. Made for: Consolidated Western Steel Corporation, Los Angeles, California. Mfg by: Best. "Cyanamid". Size: 6B72. 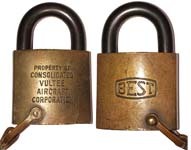 Padlock Stamp #: 0759-E. Color: Green. Made for: American Cyanamid Company, Avondale, Louisiana. Mfg by: Best. "C z". Size: 4B62. Padlock Stamp #: 0728-E. Color: Green. Made for: Crown-Zellerbach Corporation, San Francisco, California. Mfg by: Best.